This weekend it was another cross-country baking session with my friend Michele. How the heck did we decide to make pissaladière? I emailed her about my Potato-Leek Pizza and she asked if I’d ever made pissaladière. That word rang a bell, and I remembered marking a recipe for it in a Cook’s Illustrated magazine. Before that magazine, I had never heard of it before, but the recipe looked good. So thanks to Michele, instead of that recipe being relegated to the “I should make this someday” file, I actually made it. And it was really good! The crust turned out cracker-like on the outside and chewy on the inside, just as advertised in the recipe. 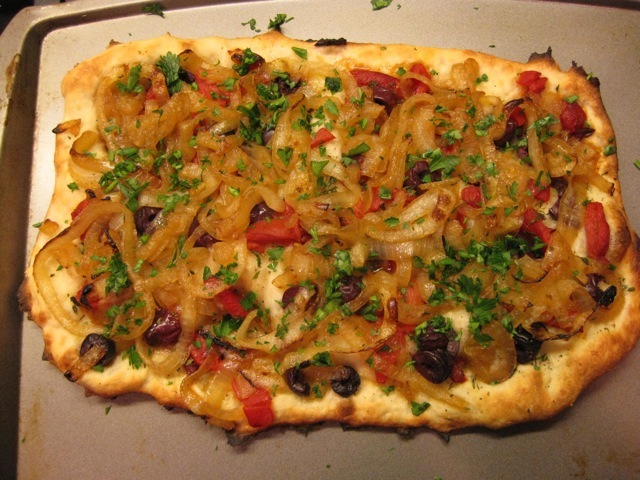 I topped my pizza with caramelized onions, kalamata olives, roasted red peppers (not in the recipe), fresh thyme, and fresh parsley (added after baking). What struck me when I read the recipe is that there is no cheese. What struck me when I ate this is that it’s really good even though there is no cheese! The recipe calls for anchovies and it makes a pretty big deal out of using them. I chose not to, but I’m sure they’d be good if you like anchovies. The recipe recommends making the dough in a food processor with a plastic dough blade. I didn’t even know that I had a dough blade, but I took a look in my box of food processor accessories and there it was! There are two options for the dough; a 1.5-2 hour rise or a slow rise in the refrigerator. I let mine rise in the refrigerator for about 20 hours and took it out to bring it to room temperature when I got started on the onions. The recipe I made from my magazine is also here here; scroll down a little for the recipe. The tips about using a plastic dough blade if you have one and letting the dough rise overnight in the refrigerator are included there, along with a couple more tips. Be sure to check out Michele’s post on her blog Veggie Num Nums. She used a different recipe to make her pissaladière and she was very happy with the results of hers too. I haven’t seen her recipe yet, so I’m eager to take a look and compare it to the one I made. Yours looks fantastic! I love that you used the fresh thyme. Isn’t it amazing how good it is without any cheese? YUM! A cracker like crust? That sounds SO good! Your pissaladiere is beautiful!!!! !